I created this next design with a stash of Maya Road chipboard and The Girls Paperie patterned paper. It's a sweet banner to go across my mantle. It's perfectly shabby, and you can get the products to recreate it at The Crafty Scrapper's booth at the Great American Scrapbook Convention this weekend. The first thing we want to share with you is this gorgeous photo display board that we'll have available at the Great American Scrapbook Convention next week designed by Melissa Sauls. It is over the top detailed and fabulous. Love the sweetly shabby elegant look she gave the chipboard and paper. This project would be so cute for your home, as a gift, or even converted into a Christmas decoration. We can't wait to show you all the other beautiful and inspiring designs we'll be taking with us to the convention. Check back tomorrow for more! Designer Sonia Doneghue created this adorable altered bottle cap using Maya Road's Super Mega bottlecap. Here are some more sweet summery designs by one of The Crafty Scrapper's guest designers Jordan Rippy. Check out this inspiration from design team member Rita Barakat using the Happy Camper collection by Imaginisce. Be sure to check these out when you stop by The Crafty Scrapper this week! I have two fun projects to share from design team member Jennifer Boehme. The first is a fun birthday card using Basic Grey papers. The balloons are so cute! 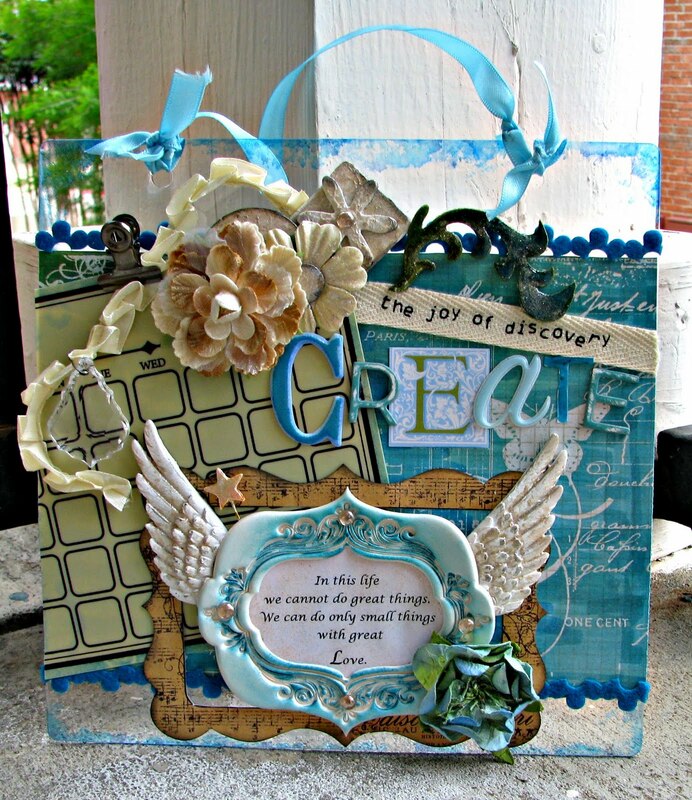 Check out this gorgeous mixed media canvas album created by designer Rita. I love the photo transfer on the left page. Be sure to check this project out in person when you're at The Crafty Scrapper! I decided since the album said Home that I needed to show images of my home and the family. I first painted the album green, inked it, and papered it with Basic Grey patterned papers. Notice the sweet diamond stickles along the edges. This page is the front of my home. I just love how cozy it looks and the American Flag. I used October Afternoon alphabet stickers "Where Your Story Begins" and then a die cut by K & Company. I then decided to show that we often have our little grandchildren come to visit with us. On these two pages I wanted to show that at Christmas time I do alot of decorating and the photo on the left is our mantel. I used Chestnut Roan Ink on the paper and then added embellshments. On the right is our Christmas tree and we also had Santa and his helper show up to surprise the grandchildren. On these two pages I added photos of Easter. They all come over the day before and we all will decorate eggs! The grandchildren really enjoy this activity. Of course the moms have to help as well. On the left is my grandson and his mom. I inked the paper and then added chipboard house and letters which I painted. I then added a little key and flower. On the right is Paityn and her mom and Kenzie and her mom. Love this sweet Maya Road ribbon flower. The photos on the left is our home when it is snowing (which is almost never) and our grandson who built a little snowman. Just looking at the photos gives me the shivers because it was soooo cold. On the right are the grandchildren in our hot tub and having a great time. Whether it is cold or hot they love getting in there to play around. These two pages show our family. The first photo is my hubby and myself and then our four children and their families. This last page has pictures of our beautiful rose bush that blooms during this time of the year until the weather turns very cold normally in mid November. I also found a little squirrel sitting in a little pot eating an acorn. I inked the papers and then added rose lace by Maya Roads and a little bow. Here's another creation by design team member Rita. She shows how to do some amazing techniques in this Maya Road mini canvas album. Be sure to take a peek at this amazing project when you visit The Crafty Scrapper this week. Guest Designer Freddie Toledo put together this super fun Spring Break mini album using Fancy Pants Beach Bum collection. A great sunny page. The colors of these papers are perfect for spring, summer, beach, and vacation photos. Gorgeous Maya Road glittered butterfly, and more amazing zipper flowers with Maya Roads trims. This sweet seashell tube is along the spine of the album. So neat! What a great idea for incorporating the shells you pick up from the beach. You can find two sizes of these tubes near the register at The Crafty Scrapper. Close up details of one of the pages, and the Ten Second Studios embossed metal that he incorporated. Fabulous! You can check out more of Freddie's designs on his blog freddietoledo.blogspot.com. 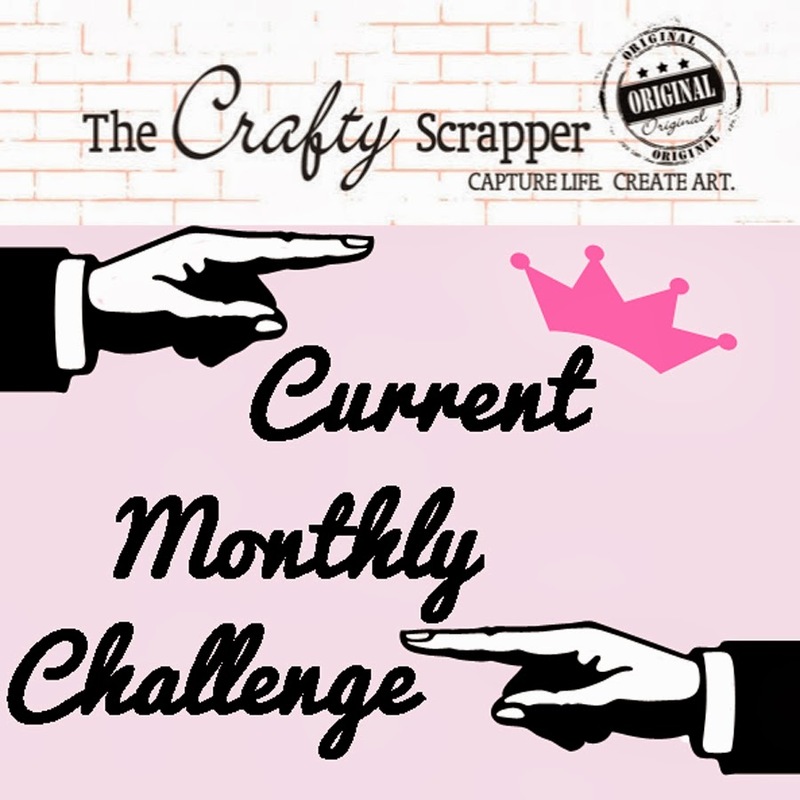 Hope to see you at The Crafty Scrapper this week! Be sure to pick up supplies for scrapping your vacation and summer memories. Hi! My name is Rita Barakat and my family was recently relocated to the giant state of Texas! I have been married to my wonderful hubby for 20 years. I am blessed to be a SAHM to five beautiful children. Lots to scrap about! before I had children I painted life-sized murals for a living. I have always loved doing anything artsy or crafty so scrapbooking was a natural progression. Most of my pages revolve around the kids but you never know what I might come up with! Living in an area without a local scrapbook store was hard for me so the first thing I did when we moved was scope out "The Crafty Scrapper" ! Eeeek!! What an amazing place, scrapbookers heaven! So you know I was totally estatic when Carolyn called me for the spot!! I cannot wait to get started! You can get to know me a little better on my blog http://letsembellish.blogspot.com ! Here's one of Rita's designs for The Crafty Scrapper. It's time to start thinking about scrapping your summer memories. Designer Jennifer Boehme created these sweet summery layouts using Maya Road embellishments and Basic Grey papers. Here's an idea of what to scrap other than your family or vacation - how about your co-workers. :) Be sure to check these out when you're at The Crafty Scrapper!